This image is an artist's depiction of a scalar array of planets in the Milky Way galaxy as detected so far by the NASA Kepler space telescope. It was made to accompany a January 2013 paper by Francois Fressin of the Harvard-Smithsonian Center for Astrophysics presented at a meeting of the American Astronomical Society where he reported that based on the number of Kepler planet finds, our Milky Way galaxy with an estimated 100 billion solar systems could potentially harbor some 17 billion planetary worlds. 2016 Exoplanet Biosignatures Workshop Without Walls. https://nexss.info/groups/ebwww. As a habitable cosmos with myriad fertile planets becomes newly evident, a meeting held in June in Seattle under NASA auspices, see below, considered how sapient Earthlings might begin to explore and quantify. It resulted in five papers on the above site, also posted on arXiv. With a lead Exoplanet Biosignature title they are: A Review of Remotely Detectable Signs of Life (1705.05791, Abstract below), Understanding Oxygen as a Biosignature in the Context of Its Environment (1705.07560), A Framework for Their Assessment, (1705.06381), Observational Prospects (1705.07098), and Future Directions (1705.08071). Each has over a dozen authors, which makes up a directory of leading researchers. A future issue of Astrobiology intends to publish. The Nexus for Exoplanet System Science (NExSS) is a NASA research coordination network dedicated to the study of planetary habitability. The goals of NExSS are to investigate the diversity of exoplanets and to learn how their history, geology, and climate interact to create the conditions for life. NExSS investigators also strive to put planets into an architectural context -- as solar systems built over the eons through dynamical processes and sculpted by stars. Based on our understanding of our own solar system and habitable planet Earth, researchers in the network aim to identify where habitable niches are most likely to occur, which planets are most likely to be habitable. Leveraging current NASA investments in research and missions, NExSS will accelerate the discovery and characterization of other potentially life-bearing worlds in the galaxy, using a systems science approach. 32 New Exoplanets Found. http://www.eso.org/public/outreach/press-rel/pr-2009/pr-39-09.html. An October 19, 2009 news release by the European Southern Observatory that its High Accuracy Radial Velocity Planet Searcher satellite has lately been able to detect over thirty additional super-Earth or Neptune-like extrasolar planets. These results were reported at the “Towards Other Earths” conference of the same date held in Porto, Portugal, whose own website is http://www.astro.up.pt/investigacao/conferencias/toe2009/. Commentators mused that a fertile natural nursery is being realized, which seems to want to seed itself with habitable, earth-like ovular worlds. At Least One in Six Stars Has an Earth-sized Planet. www.cfa.harvard.edu/news/2013/pr201301.html. A press release by the Harvard Smithsonian Center for Astrophysics about a presentation at the January 2013 meeting of the American Astronomical Society by resident researcher Francois Fressin. His paper proposed that based on awesome results from the Kepler Planet Finder satellite whence almost every star has a solar system, with one/sixth estimated to have an earth analog, then of the 100 billion stars composing our Milky Way there ought to be some 17 billion earth-like worlds amongst our galaxy alone. Of course this went viral in the media, for one example the cover of Macleans Magazine for January 28, 2013 called it “The Greatest Discovery Ever,” which if you really think about its implications is not overstated. An article in the issue “Planet Hunting” by Kate Lunau offers a good review. Fressin’s report will appear in The Astrophysical Journal. Binary Star Systems. www.space.com/22509-binary-stars. An informational posting by this science and astronomy site about the prevalence, classes, and evolution of multiple stellar systems. See also Binary Stars on the Australia Telescope National Facility for more info. A consensus is that two or more stars clustered together is a more common astral condition than our single home sun. Exoplanet Data Explorer. www.exoplanet.org. A 2017 eclectic repository for all manner of technical findings about vast varieties of astro-globular objects and their relative solar system locales. The Exoplanet Data Explorer is an interactive table and plotter for exploring and displaying data from the Exoplanet Orbit Database. The Exoplanet Orbit Database is a carefully constructed compilation of quality, spectroscopic orbital parameters of exoplanets orbiting normal stars from the peer-reviewed literature, and updates the Catalog of nearby exoplanets. Extrasolar Planets Encyclopedia. http://exoplanet.eu/. A comprehensive site hosted since 1995 by the “Exoplanet team” at the CNRS-LUTH Paris Observatory. When I first logged in this interactive catalog in October 2008, some 300 planets were listed. This number has grown to over 1,800 by April 2014. Many sources and links allow one to visit, e.g. a Habitable Zone Gallery. A technical and popular bibliography is included along with listings of many ground and space research projects. From Cosmic Births to Living Earths. www.hdstvision.org/report. A 2015 clarion document from AURA: Association of Universities for Research in Astronomy, Julianne Dalcanton, University of Washington and Sara Seager, MIT, Co-Chairs, for the Future of UVOIR (near ultraviolet to far infrared) Space Astronomy. On this site for a next generation HDST: high definition space telescope beyond Hubble and NASA projects is the main 177 page report, an executive summary, and a press release. The title is a response to a 1997 statement by the Nobel laureate Riccardo Giaconi that the 21st century should have of goal of connecting the development of genetic life to physical universe origins. Open Exoplanet Catalogue. www.openexoplanetcatalogue.com. A home page for a database source of discovered extrasolar planets, almost 3,500 to date. An initial guide lists all exoplanets, habitable zone planets, and planets in binary systems. The site then directs to repositories of detailed specifications. Vision and Voyages for Planetary Science in the Decade 2013-2022. http://www.nap.edu/catalog.php?record_id=13117. A 400 page report by the Committee on Planetary Science, Space Studies Board, National Research Council, also published in paper by the National Academies Press (2012). Numerous authorities contribute chapters spanning the formation, variety, material make up, habitability, and so on, of worlds, moons, and stellar systems as we begin to engage this revolutionary vista. With this basis and motive, satellite and exploratory missions are scoped out as earthkinder goes forward in search of new neighbors. Adibekyan, Vardan. 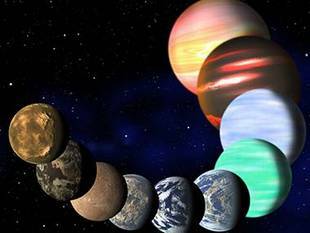 Formation and Evolution of Exoplanets in Different Environments. arXiv:1701.01661. We cite this contribution by the University of Porto, Portugal astronomer as a example of how a worldwise Earthkinder is proceeding to study and learn about galactic condensations of a prolific cosmos as it engenders an infinity of orbital worlds. See also Observational Evidence for Two Distinct Giant Planet Populations (1705.06090), and Big, Bigger, Biggest in The Economist for July 15. The ultimate goal of exoplanetologists is to discover life outside our Earth and to fully understand our place in the Universe. Even though we have never been closer to attaining this goal, we still need to understand how and where the planets (efficiently) form. In this manuscript I briefly discuss the important role of stellar metallicity and chemistry on the formation and evolution of exoplanets. Adibekyan, Vardan, et al. How Alien can Alien Worlds Be?. arXiv:1710.07482. As exoplanetary studies shift from an initial detection stage to an extensive telescopic, instrumental, and computational phase, Instituto de Astrofísica e Ciências do Espaço, Universidade do Porto, Portugal researchers provide another review of how this latest project might proceed with regard to what kind of exoworld geochemistry, metallicity, atmospheres, conductivity for life, and more. Adibekyan, Vardan, et al. Which Type of Planets do We Expect to Observe in the Habitable Zone? Origins of Life and Evolution of Biospheres. Online June, 2016. With Pedro Figueira and Nuno Santos, University of Porto, Portugal, astrophysicists proceed to quantify our myriad new neighbors so as to identify and characterize what manner are likely to be in conducive locales as our home Earth. See also by the lead author Formation and Evolution of Exoplanets in Different Environments at arXiv:1701.01661. And how fantastic is it that a collaborative planetary species can begin a cosmic census across a widest stochastic diversity of potentially ovular worlds.